Often compared to winching an anvil up through a football field of water, battling amberjack can challenge just about any angler or tackle. When hooked, amberjack don’t display the flash of a king mackerel or speed of a tuna, but they exhibit incredible strength. Sometimes dubbed “reef donkeys,” amberjack can grow to more than 150 pounds. John Stout landed the Texas state record, a 121-pounder that measured 65 inches long on August 20, 2005, but Steele Buckholtz speared a 128.75-pounder in July 2009.
is all smiles after winning a pitched battle with this amberjack. Amberjack prefer to stay in 70 to 400 feet of water around rock piles, shipwrecks, coral reefs and other places where they find cover to ambush prey. Voracious predators, amberjack feed heavily upon squid, crustaceans, reef fish or anything else they can gulp. Although smaller AJs may congregate in schools, bigger jacks rule their deep and dark domain alone — and that’s how most other reef species like it! Typically, when big amberjack cruise through an area, everything else moves out. To catch big amberjack, most anglers simply drop a hook baited with squid, cigar minnows, fish chunks or Spanish sardines to the bottom. Cut slices into the meat to let enticing juices ooze out. Small, live fish also work very well. For monster AJs, use large baits since a 100-pound bruiser can easily engulf a hefty meal. Big amberjack don’t always hover near the bottom. Sometimes, they rise in the water column or may even approach the surface to investigate activity. Chumming can entice amberjack near the top. Chop bait or trash fish into bite-sized morsels and toss them into the water. Then, rig a drift line with live bait. Don’t use any weight so the fish can swim freely. Drifting a livie, anglers might also catch grouper, snapper, cobia, mackerel or wahoo — perhaps even tuna or sailfish. Some anglers also troll live bait or diving plugs around oil platforms and over reefs. Circle the platforms several times and use various lures of different colors that dive to different depths. Around reefs, run the baits just over the top of the structure. To get really deep, some anglers attach trolling lures to downriggers. Protruding from the surface and usually well lit with lights, petroleum production structures provide the most visible places to fish. With structure ranging from top to bottom, oil platforms provide fish three-dimensional cover throughout the water column. In addition, the bottom around a platform usually contains many objects that fell off the rig or junk workers tossed into the water. 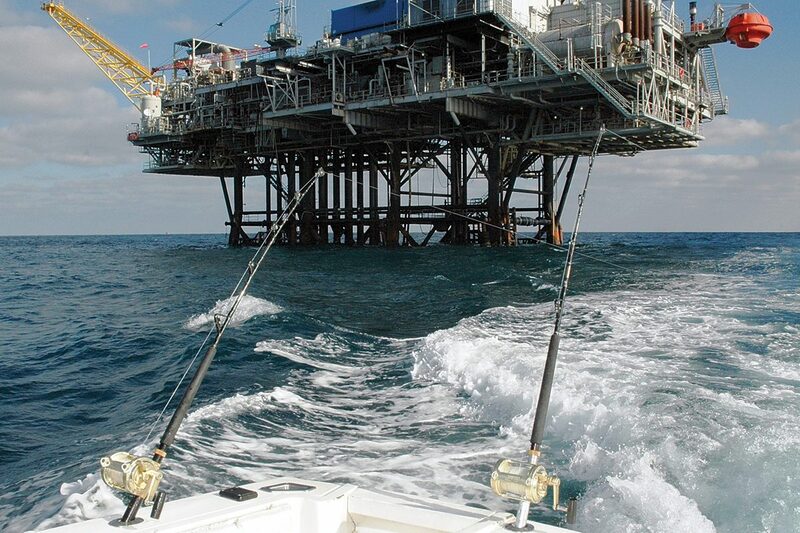 While petroleum platforms create the most visible fish attractors, many natural or artificial reefs also offer excellent fishing along the Texas coast. One of the biggest artificial reefs in Texas, the 473-foot long Texas Clipper served as a World War II troopship. It now sits in 132 feet of water about 17 miles northeast of South Padre Island. The top of the ship comes up to within 50 feet of the surface. An artificial reef near Port Mansfield includes three sunken World War II Liberty ships sitting about 90 to 100 feet deep. The Port Mansfield Liberty Ship Reef sits about 15 miles east southeast of the Port Mansfield jetties. About 115 miles east of Galveston, the Flower Garden Banks sit in about 200 to 400 feet of water, but some peaks top out about 65 feet deep. East Flower Garden Bank sits at about 27.90 degrees North and 93.60 degrees West and measures about 40 square miles. About seven miles west, West Flower Garden Bank covers 46 square miles. Bright Bank sits about 11 miles east of East Flower Garden Bank and rises to within 114 feet of the surface. 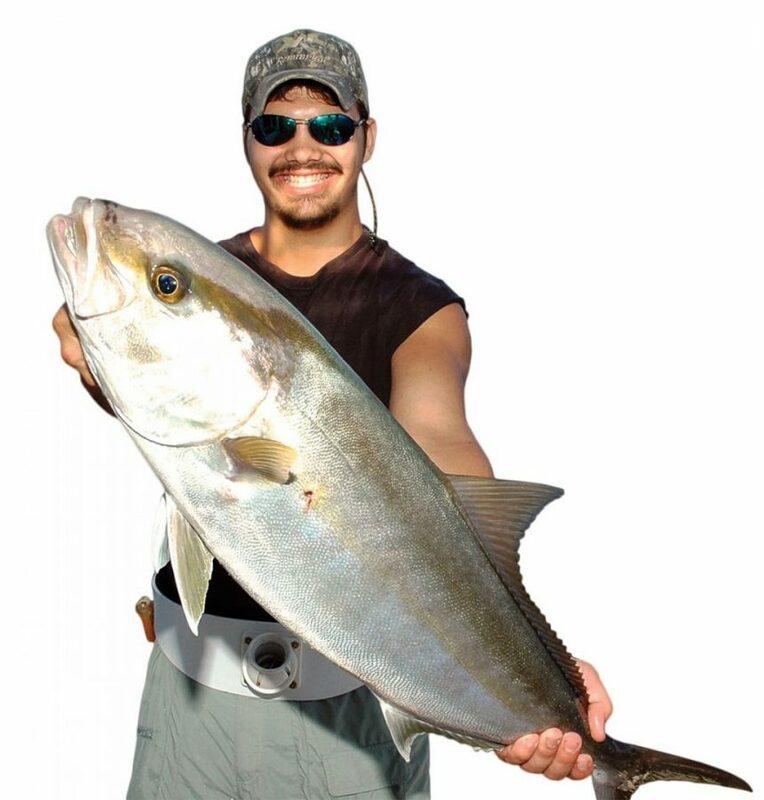 Nearly any rig, wreck, or reef in sufficiently deep water off Texas may hold some amberjack. Just bring Texas-sized tackle to handle these beasts of the deep!